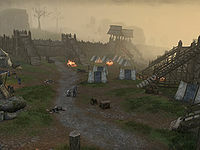 The Lion Guard Siege Camp is an encampment just south of Camlorn. The Lion Guard had mustered here in order to try and retake the city from Faolchu and his werewolves, but they overran the camp as well. This page was last modified on 19 November 2018, at 06:13.